Cannikin was an underground nuclear weapons test performed on November 6, 1971, on Amchitka island, Alaska, by the United States Atomic Energy Commission. The experiment, part of the Operation Grommet nuclear test series, tested the unique W71 warhead design for the LIM-49 Spartan anti-ballistic missile. With an explosive yield of almost 5 megatons of TNT (21 PJ), the test was the largest underground explosion ever detonated by the United States. Prior to the main five megaton test in 1971, a 1 Mt (4.2 PJ) test took place on the island on October 2, 1969, for calibration purposes, and to ensure the subsequent Cannikin test could be contained. This test, Milrow, was included in the Operation Mandrel nuclear test series. The Cannikin test faced considerable opposition on environmental grounds. The campaigning environmental organization Greenpeace grew out of efforts to oppose the test. The Cannikin test was too large to be conducted safely in Nevada. Amchitka had been considered in the 1950s as a potential nuclear test site, but had been deemed unsuitable at that time. In 1965, a single nuclear test, Long Shot, was carried out on the island for the purposes of seismic test detection development, under program Vela Uniform. Preparation for the test took place over five years and involved hundreds of staff from the Lawrence Radiation Laboratory, later the Lawrence Livermore National Laboratory. 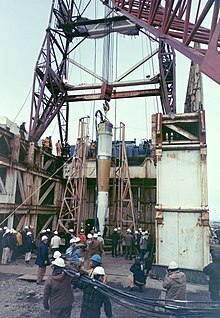 Drilling for the shaft for the Milrow test began in March 1967, with drilling for the Cannikin test commencing in August 1967. To perform the test, 400 tons of equipment was placed in a shaft 1,870 metres (6,150 ft) deep and 2.3 metres (90 in) wide. Test support equipment was designed to survive a ground upheaval of 4.6 metres (15 ft) at test time. Chairman of the Atomic Energy Commission, James R. Schlesinger, brought his wife and two daughters to Amchitka for the test to emphasize the safety of the test. Both the 1969 calibration test and Cannikin itself attracted protest. Because of the 1964 Alaska earthquake, the plans raised concerns that tests might trigger earthquakes and cause a tsunami. A 1969 demonstration of 7,000 people blocked a major U.S.-Canada border crossing in British Columbia, carrying signs reading "Don't Make A Wave. It's Your Fault If Our Fault Goes". Further demonstrations occurred at Canada–US border crossings in Ontario and Quebec. The Canadian Don't Make a Wave Committee founded that year, in Vancouver, attempted to halt further nuclear testing on the Aleutian islands chain that swings across the Bering Sea from North America almost to the Russian coast. With the intention of sailing to Amchitka to protest the 1971 test, the committee chartered a ship it renamed Greenpeace. The ship was turned back by the U.S. Coast Guard. However, under this name, the organization created for the protest continued to exist as the campaigning environmental organization Greenpeace. In July 1971, the anti-nuclear Committee for Nuclear Responsibility filed suit against the Atomic Energy Commission, asking the court to stop the test. The suit was unsuccessful, with the Supreme Court denying the injunction by 4 votes to 3. ^ a b "Accomplishments in the 1970s: Lawrence Livermore National Laboratory". Archived from the original on 2005-02-17. Retrieved 2006-10-09. ^ Giblin, Michael O.; David C. Stahl; Jodi A. Bechtel. Surface remediation in the Aleutian Islands: A case study of Amchitka Island, Alaska (PDF). WM '02 Conference, Tucson AZ, February 24–28, 2002. Retrieved 2006-10-07. ^ Protests fail to stop Nuclear Test countdown, The Free-Lance Star - Oct 2, 1969, Accessed via Google News Archive October 4, 2009. ^ Brown, Michael; May, John (1991). The Greenpeace Story (2nd ed.). London: Dorling Kindersley. ISBN 0-86318-691-2. ^ Alaska is Braced for Atomic Shock, St. Petersburg Times - Oct 2, 1969. Accessed via Google News Archive October 4, 2009. Has a subtitle - Demonstrators picket US Embassy in Ottawa. ^ "Round 2 at Amchitka". U.S. TIME. New York City. 1971-07-17. Archived from the original on 2008-12-21. Retrieved 2006-10-09. ^ "The Amchitka Bomb Goes Off". TIME. 1971-11-15. Retrieved 2006-10-09. This page was last edited on 10 April 2019, at 07:05 (UTC).